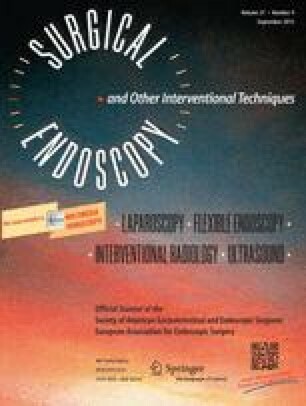 The European Association of Endoscopic Surgery (EAES) initiated a consensus development conference on the laparoscopic resection of colon cancer during the annual congress in Lisbon, Portugal, in June 2002. A systematic review of the current literature was combined with the opinions, of experts in the field of colon cancer surgery to formulate evidence-based statements and recommendations on the laparoscopic resection of colon cancer. Advanced age, obesity, and previous abdominal operations are not considered absolute contraindications for laparoscopic colon cancer surgery. The most common cause for conversion is the presence of bulky or invasive tumors. Laparoscopic operation takes longer to perform than the open counterpart, but the outcome is similar in terms of specimen size and pathological examination. Immediate postoperative morbidity and mortality are comparable for laparoscopic and open colonic cancer surgery. The laparoscopically operated patients had less postoperative pain, better-preserved pulmonary function, earlier restoration of gastrointestinal function, and an earlier discharge from the hospital. The postoperative stress response is lower after laparoscopic colectomy. The incidence of port site metastases is <1%. Survival after laparoscopic resection of colon cancer appears to be at least equal to survival after open resection. The costs of laparoscopic surgery for colon cancer are higher than those for open surgery. Laparoscopic resection of colon cancer is a safe and feasible procedure that improves short-term outcome. Results regarding the long-term survival of patients enrolled in large multicenter trials will determine its role in general surgery.